Questions? Not sure what you need? Worldwide Leader in Sealer Sales for 40 years! This is a great little crimper to use trimming shrink film from gift baskets, or sealing poly bags. Has illuminated off off switch. 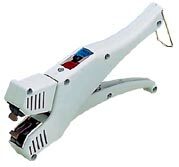 This 6" hand held Crimper is great for sealing cellophane and light foil bags. It provides a nice 1/2" wide flat seal across the bag top. . Squeeze it, count to "3" and you're done! Simple and inexpensive! Dual Heat Settings, this multipurpose hand held constant heat clamshell sealer provides a 1/2" x 1/4" spot heat seal. Perfect for sealing clamshells to prevent loss. Will spot seal OPS, PSP, PVC, and ESP Food and clear salad containers too! © Copyright 2001-2013 ATW Manufacturing Company, Inc.